After completion of all the required courses of the BBA Program from University of Development Alternative, it is an indispensable part of the study to get involved in a practical professional environment for 3 months. I joined AB bank Limited (Dhanmondi Branch.) as an intern. My assigned supervisor advised me to execute the report on “Retail Banking Operation of AB Bank Limited. The Dhanmondi Branch is the active Branch of AB Bank Ltd, full of ideal commercial activities. Since this branch performs the entire banking role, as a result, one can easily learn all simple and intricate banking operations. This report is the output my last three months’ endeavor during a practical experience. This report was prepared on the basis of this Bank’s current conditions and management systems in credit sectors. General objective of the study is to analysis the Consumer Credit of AB Bank Ltd. The broad objective of preparing this study is to get an overall idea about the Consumer Credit Management System in banking sector by working in practical world. To analysis the pros and cons of the conventional ideas about consumer credit operation of a Bank. To have better orientation on consumer credit management activities specially consumer credit policy and practices, appraisal, processing steps, of AB Bank Ltd.
To compare the existing credit policy of AB Bank limited with that of best practices guideline given by Bangladesh Bank, the central bank of Bangladesh. To identify and suggest scopes of improvement in consumer credit management of AB bank Ltd.
To get an overall idea about the performance of AB Bank Ltd. The study encompasses organizational profile of ABBL. The study is also focused the credit flows of, overall credit management system and the strategies of it, micro and macro impact of credit disbursement in the private sector and the strategies to attract and retain credit seeking customers of AB Bank Ltd. Methodology will include direct observation, face-to-face discussion with employees of the different departments of the AB Bank Ltd., clients, study of files, circulars & overall practical experience of last three months. Annual Report of AB Bank Ltd. Periodicals published by the Bangladesh Bank. Browsing of different web sites in the Internet. The significance of the study is to gain an inside knowledge about the strategies used to attract and retain clients using the AB Bank consumer credit line. The present study could be very important to the Stakeholders in AB Bank Ltd. The credit department is the most important department in generating revenue for a Bank. This study will also give valuable information and insight on the functioning of the Credit Department to the employees of AB Bank Ltd. The employees will be able to see if their efforts have been up to the mark according to the clients’ expectations. If it is not up to the mark, then they can increase their efforts to meet the clients’ expectations and excel in their profession. To make a report various aspects and experience are needed. But I have faced some barriers for making a complete and perfect report. These barrier or limitations which hinder my work. The main constraint of the study is inadequate access to information, which has hampered the scope of the analysis required for the study. Some problems create confusions regarding verifications of data. The time is insufficient to know all activities. Some employee cannot provide appropriate information. Because they have lack of knowledge about their work. AB Bank Limited, the first private sector bank was incorporated in Bangladesh on 31st December 1981 as Arab Bangladesh Bank Limited and started its operation with effect from April 12, 1982. AB Bank is known as one of leading bank of the country since its commencement 27 years ago. It continues to remain updated with the latest products and services, considering consumer and client perspectives. AB Bank has thus been able to keep their consumer’s and client’s trust while upholding their reliability, across time. During the last 28 years, AB Bank Limited has opened 74 Branches in different Business Centers of the country, one foreign Branch in Mumbai, India and also established a wholly owned Subsidiary Finance Company in Hong Kong in the name of AB International Finance Limited. To facilitate cross border trade and payment related services, the Bank has correspondent relationship with over 220 international banks of repute across 58 countries of the World. In spite of adverse market conditions, AB Bank Limited which turned 27 this year, concluded the 2008 financial year with good results. The Bank’s consolidated profit after taxes amounted to Taka 230 crore which is 21% higher than that of 2007. The asset base of AB grew by 32% from 2007 to stand at over Tk 8,400 cr as at the end of 2008.The Bank showed strong growth in loans and deposits. Deposit of the Bank rose by Tk. 1518 crore i.e., 28-45% while the diversified Loan Portfolio grew by over 30% during the year and recorded a Tk 1579 core increase. 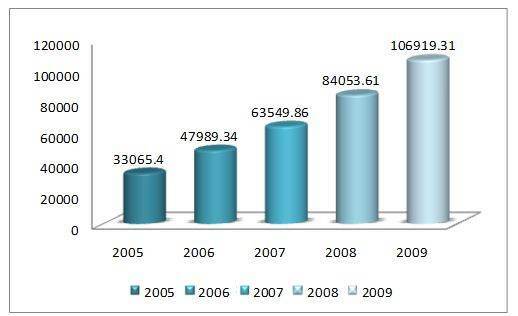 Foreign Trade Business handled was Tk 9,898 crore indicating a growth of over 40% in 2008. The Bank maintained its sound credit rating in 2008 to that of the previous year. The Credit Rating Agency of Bangladesh Limited (CRAB) awarded the Bank an Al rating in the long term and ST-2 rating in the short Term. From 14th November 2007 Bank changed its existing logo and presently known as AB Bank Ltd. instead of Arab Bangladesh Bank Limited. Mission Statement to be the best performing bank in the country. Vision Statement to be the trendsetter for innovative banking with excellence & perfection. To mobilized resources form within the country for suitable and profitable investment. To create new entrepreneur in the field of trade, commerce and industry by creating their financial need and providing guidance and advice towards right direction of investment. To help formation of capital, broaden the investment base and develop the capital market. To contribute in the field of industrialization of the country and growth of National Economy. 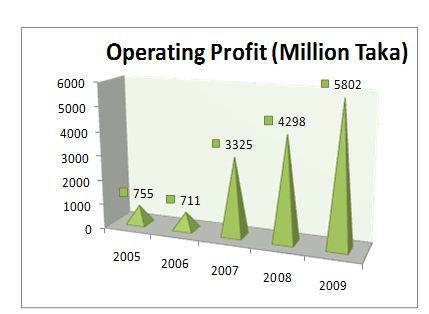 From the graph above we can see that the bank continues to increase its operating profit from the year 2006 to 2009.so it could be predicted that the bank will be able to increase its profit in future. From the above Graph we can see that the total assets of the Bank has increased gradually from 2005 to 2009, so it could be predicted that the bank will be able to continue its assts increasing in future. 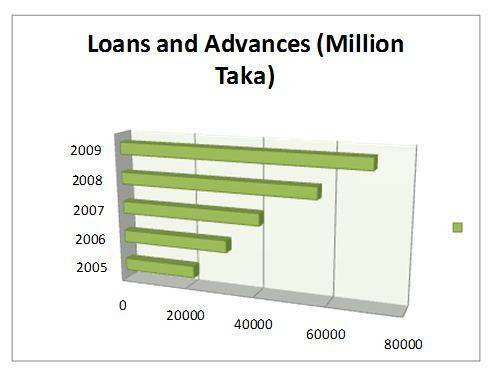 The graph shows that the bank continues to increase the amount of loans and advances from 2005 to 2009 and it could be predicted that the bank would remain increasing the amount of its loans and advances in future. 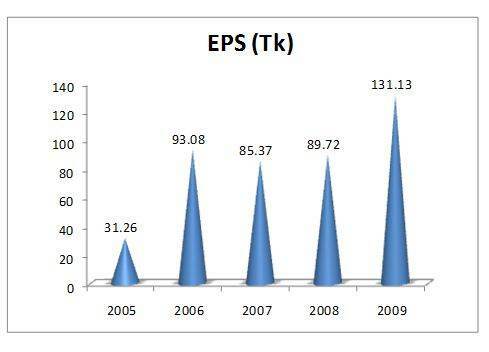 The graph shows that EPS has decreased in 2006 but after that it started increasing gradually and could be predicted it will keep increasing in future. The graph shows that the bank continues to increase the amount of its deposits from year 2005 to 2009 and could be predicted that it will remain increasing in future. The Graph shows that the bank continues to have an increasing amount of profit after tax(PAT) in every year and could be predicted that it will remain increasing in future. Credit is the provision of resources (such as granting a loan) by one party to another party where that second party does not reimburse the first party immediately, thereby generating a debt, and instead arranges either to repay or return those resources (or material(s) of equal value) at a later date. It is any form of deferred payment. The first party is called a creditor, also known as a lender, while the second party is called a debtor, also known as a borrower. Credit need not necessarily be based on formal monetary systems. The credit concept can be applied in barter economies based on the direct exchange of goods and services, and some would go so far as to suggest that the true nature of money is best described as a representation of the credit-debt relationships that exist in society (Ingham 2004 p.12-19). The word credit is used in commercial trade in the term “trade credit” to refer to the approval for delayed payments for purchased goods. 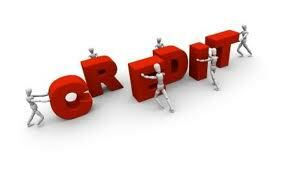 Credit is sometimes not granted to a person who has financial instability or difficulty. Companies frequently offer credit to their customers as part of the terms of a purchase agreement. Organizations that offer credit to their customers frequently employ a credit manager. Consumer debt can be defined as ‘money, goods or services provided to an individual in lieu of payment.’ Common forms of consumer credit include credit cards, store cards, motor (auto) finance, personal loans (installment loans), retail loans (retail installment loans) and mortgages. This is a broad definition of consumer credit and corresponds with the Bank of England’s definition of “Lending to individuals”. Given the size and nature of the mortgage market, many observers classify mortgage lending as a separate category of personal borrowing, and consequently residential mortgages are excluded from some definitions of consumer credit – such as the one adopted by the Federal Reserve in the US. Interest and other charges are presented in a variety of different ways, but under many legislative regimes lenders are required to quote all mandatory charges in the form of an annual percentage rate (APR). The goal of the APR calculation is to promote ‘truth in lending’, to give potential borrowers a clear measure of the true cost of borrowing and to allow a comparison to be made between competing products. The APR is derived from the pattern of advances and repayments made during the agreement. Optional charges are not included in the APR calculation. So if there is a tick box on an application form asking if the consumer would like to take out payment insurance, then insurance costs will not be included in the APR calculation . Validity of loan Not more than 30 days from the date of approval. Loan Limit 80% of the value for brand new car.,80% of the value for reconditioned car . Tenor Brand new :12 – 72 months, Unregistered reconditioned car (as per import policy): 12-60 months. Security A . Spouse/ parent guarantee B .Joint registration of the vehicle & IGPA to sell the vehicle. Tenor 12 to 48 months. Security A .student guarantee B . Spouse/ parent guarantee C.Admission offer from University/Institution. D. Admission fee to be paid directly to the University/ Institution. An insolvent bank won’t return funds to a depositor. Sovereign risk is the risk of a government becoming unwilling or unable to meet its loan obligations, or reneging on loans it guarantees. The existence of sovereign risk means that creditors should take a two-stage decision process when deciding to lend to a firm based in a foreign country. Firstly one should consider the sovereign risk quality of the country and then consider the firm’s credit quality. Counterparty risk, otherwise known as default risk, is the risk that an organization does not pay out on a credit derivative, credit default swap, credit insurance contract, or other trade or transaction when it is supposed to. Even organizations who think that they have hedged their bets by buying credit insurance of some sort still face the risk that the insurer will be unable to pay, either due to temporary liquidity issues or longer term systemic issues. Credit insurance and credit derivatives: Lenders and bond holders may hedge their credit risk by purchasing credit insurance or credit derivatives. These contracts the transfer risk from the lender to the seller (insurer) in exchange for payment. The most common credit derivative is the credit default swap. Deposit insurance: Many governments establish deposit insurance to guarantee bank deposits of insolvent banks. Such protection discourages consumers from withdrawing money when a bank is becoming insolvent, to avoid a bank run), and encourages consumers to holding their savings in the banking system instead of in cash.